Yes, yes, EVERYBODY loves the 401 Trail. It’s been in all the mags, has been plenty of Facebook banners, and is probably the most Instagrammed trail in Colorado. For good reason—it’s amazing. However, the stunning amount of ridiculously scenic singletrack in Crested Butte (CB) is hard to fathom. Check out these alternatives that promise to deliver the same, or better, epic sweeping vistas, wildflowers of every color, long, lung-busting climbs, and even longer descents that are sure to induce perma-grin. Before heading out, it’s worth downloading the free CBGTrails app for Android or iOS. 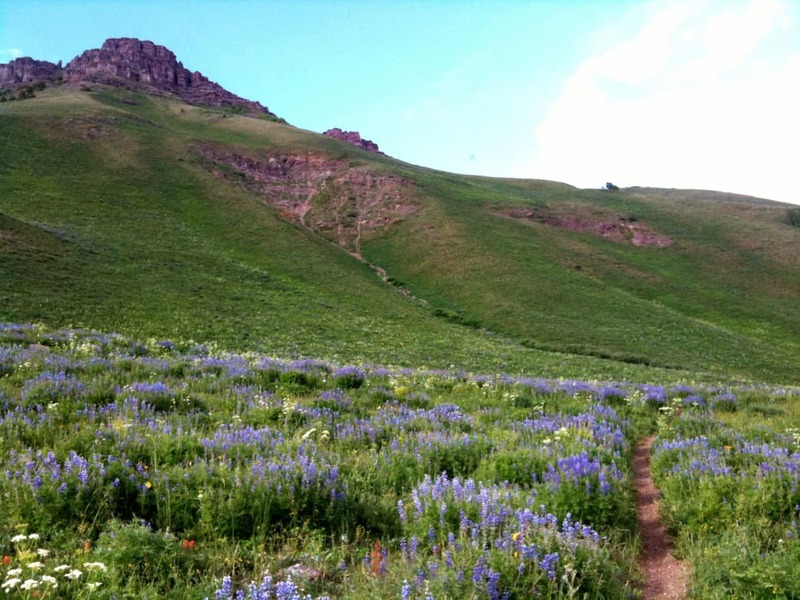 It contains terrain maps showing over 750 miles of trails in the Crested Butte / Gunnison Valley area. If you’re the competitive type, the TrailQuest leaderboard lets you compete for real-world prizes such as stickers, hats, and jerseys—just log enough unique trail miles to qualify and the booty can be yours (as well as bragging rights). Teocalli is many locals’ favorite ride. Recently reopened after a long re-route and many improvements, Teocalli is back and better than ever. This high-alpine trek is classic CB, with a big climb that burns the legs and tests cardiovascular fitness as it tops out at over 11,200 feet above sea level. Then, the downhill starts and riders are reminded why they started riding bikes in the first place. There’s a little bit of everything—fast-charging trail through pristine aspen stands, negotiating tight and techy switchbacks, and pinning buff and flowy open meadows. Start on Brush Creek Rd. 2 miles south of town and get ready to see why this is a classic route. There’s something for everyone on this ride: tearing through the woods, picking a line through techy rock gardens and rooty sections, scenery-blurring meadows, and as always, gawking at expansive, humbling panoramas. If in CB during the fall, this is an absolute must do! The trail snakes through a giant aspen grove that happens to be one of the largest living organisms on the planet. The sensory overload of riding under a quaking yellow canopy while golden leaves flutter in riders’ wake is something that is not soon forgotten. Riders will have their cardio power tested by short, explosive, climbs that grant entry to delicious segments of rolling alpine terrain. There is a 14-mile loop option, but that includes 9 miles of road/double track for 5 miles of trail. It’s certainly picturesque and does reduce the climbing a bit, but if the legs are up for it, doing it as an out-n-back is nice. If riding Dyke from town, take the Kebler Wagon Trail/606. It parallels Kebler Pass Rd, adds 6 miles of trail and starts/ends just 3 miles outside of town. This is high-alpine riding at its best. It also may be the least-photographed trail in Crested Butte due to its insane flow and speed—no one wants to stop and take pics. Which is a shame, really, as it’s in the running as the most spectacularly gorgeous stretch of singletrack in CB, and that’s saying something. The actual Hunter Creek Trail is only 2 miles long, so it’s always done combined into a loop with other trails. This may be the best 2 miles on the planet, with pretty much all of it downhill. Postcard-worthy views in every direction look out on some of Colorado’s most dramatic mountain scenery. A good intermediate way to go is to park on Cement Creek Rd. and take Upper Cement Trail to Crystal Peak (Trail 583), then to Star Pass (400). 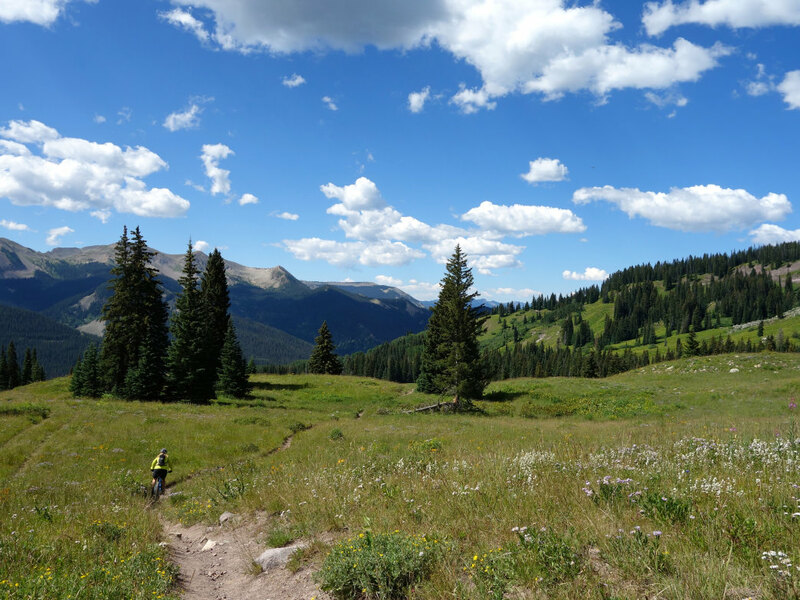 At the top of this pass, soak in the views and try to breathe at the 12,300’ elevation. Go left on Double Top to the downhill on Hunter’s, then hang on for the fun. If looking for a difficult route, add in Double Top and Block and Tackle. Like Hunter Creek, 409.5 is short, so it’s combined with others into a double-lasso loop. Link ups are the name of the game in most of CB. The bonus of this trail is that it’s not ridden by the masses, so even during high season, traffic is pretty low. Most people do it as a double lasso with 409 and Point Lookout. The climb up 409 used to be rutted out and loose, but the Crested Butte Mountain Bike Association put in a ton of work to fix big sections and re-route others, and they added the Point Lookout Trail, making this ride a soon-to-be classic. Expect a good mix of fast, wide-open meadows, and sun-dappled aspen groves with some tricky rock gardens and rooty sections to keep riders honest. Pro Tip: At the bottom of 409.5, hit up Strand Hill or Strand Bonus back into town. It’s a little extra climbing, but at that point, half of the climb to the top of either of these is already done, and the reward is almost 5 miles of extra downhill action on 5-star singletrack. This is another great adventure that doesn’t get too much traffic. Canyon Creek is 90 minutes from Crested Butte over in White Pine. This ride has one of the best climb-to-descent ratios out there, but getting to the top is going to take a bit of suffering. 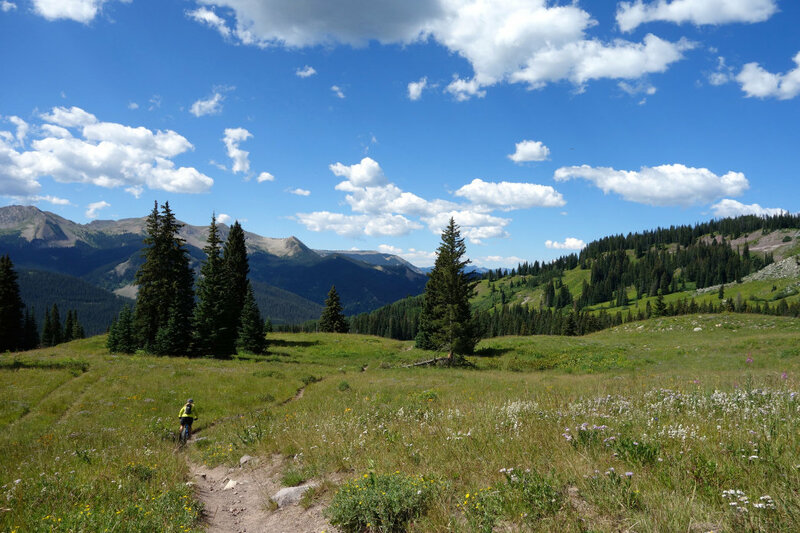 Look forward to climbing a rugged, 8.5-mile-long dirt road strewn with baby heads, then pushing up a series of steep, loose, switchbacks while struggling to breathe to top out above treeline at over 12,600 feet. However, the intrepid/stupid are handsomely rewarded with one of the loooongest downhills in the game. For those doing the math, that’s 11.5 miles of descending. Let that sink in. Start off with steep and techy gnar across tundra, then it’s blinding speed and flow, flow, flow, through the trees. Get to the bottom, shake off the arm pump and replace the brake pads. Start at the Snowblind Campground on Tomichi Pass Road.